Am I Running A Day Care or What?? My husband and daughter laughingly asked me, if I was setting up a day care center....in other words they think I'm out of control, as usual. Actually, I'm being a little selfish, as I set up a little play corner, for my darling little granddaughters, one of whom, I babysit one day a week....oh, and did I mention another baby is on the way. This little corner is right beside my sewing studio.....so you know what that means!!! You guessed it I can quilt and babysit, all at the same time. I also like for my grandchildren, to be exposed, to lots of creativity. Isn't that the most adorable little kitchen you've ever seen? It almost makes me want to start cooking....on second thought, I think I'll pass. And true to form, look at the beautiful easels I bought the little girls, for Christmas......I really do believe in encouraging creativity. Dan of Piece and Press asked me the other day, if this was my first time creating QAYG Wonky Borders.. and it is. I'm thinking, that is a wonderfully, appropriate name......thanks, Dan. Take some Wonky Borders, add some strips to create stripes, and things start happening. The unexpected surprise is the wonderful striped scraps, which will be put right back, into the quilt. I'll be using some of the other QAYG joining methods as well. For the moment I'm just playing with all these delightful pieces. I created a mosaic with some of the photo's I took, while auditioning, different background fabrics. I want my quilts to be ART, but I still want my ART to be a quilt. A real life, touch, hold, throw in the wash, type quilt......to be snuggled under, hung on the wall or draped artistically on some ladder or chair, making a lovely statement in a room. to be used in daily life. The back is looking rather interesting. Hmm, just how many colours can I add in there? Look at the interesting scraps I am accumulating....I have a plan, sort of. Does the thought of improvisational quilting and design sends shivers of anticipation and fear up your spine? Are you scared of cutting into your most precious fabrics? Are you blocked, with no idea, of what you want to create...... but want to create something? 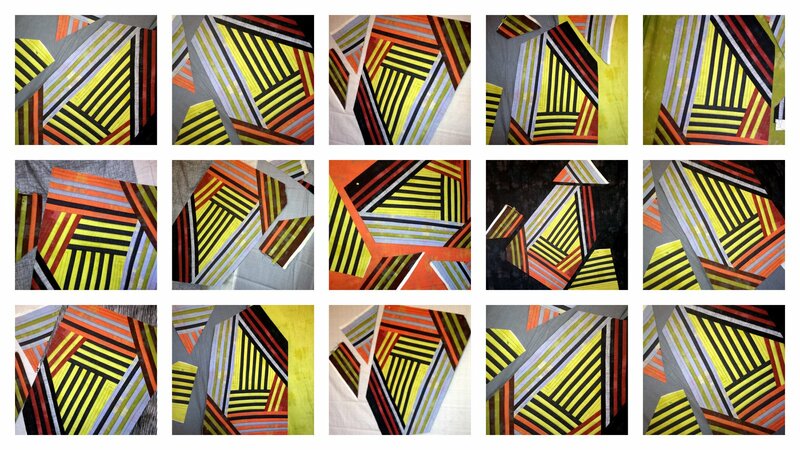 I discovered a number of years ago, that just cutting strips and improvising, can be very liberating. Just going into your stash and cutting a number of strips, at various lengths, can be very freeing. After all you are only taking a strip or two...what could possibly go wrong? Not to much, I promise....you will probably find the experience very freeing. 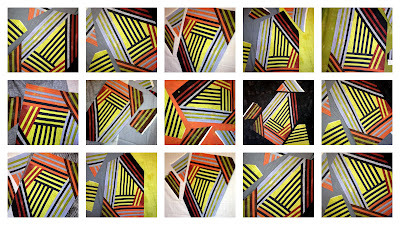 A little free form log cabin partnered with QAYG........ is my first improvisational quilt of this type (2007). I woke up this morning, to find this fabulous book, create your own free-form quilts by Rayna Gillman in my mail box. It made my day!! If improvisational is something you long to try, this book is for you. Rayna's book is fun, inspirational and very well laid out....and not intimidating in the least. I have a number of books on liberated or improvisational quilting, but this particular one, really strikes a chord with me. I highly recommend it...my fingers are itching to start sewing. Rayna also incorporates the use of scraps....does anyone have a shortage of those?? It's been snowing and blowing all day long. I've been away from the sewing machine for a few weeks and I've been anxious to get back to it, but I sort of had to force myself, down to the cold basement. Funny how that works.....when I should be doing other things I'm down there quilting up a storm and when I finally have some time it's like pulling teeth getting started. Often, when I'm feeling like that, I just go down and play with some ideas that have been sitting there for a while. That's probably why I have so many projects on the go. to my sun drenched little corner....in my west coast home. We arrived back in Alberta yesterday, after a two day drive. We usually fly but my husband took an innocent trip to the hardware store, last week, and came home with a new car and there was no guilt. I don't understand......if a woman goes out to buy a sewing machine needle and comes home with a new sewing machine she would be guilt smitten. But a man goes out for a battery charger and comes home with a new car....well enough said, the car brought us safely through the snowy mountains. Now to switch gears, from island life, to snow country......sigh.